The meeting starts and everyone around me instinctively stands up and faces towards the front of the room. It takes me a couple seconds to realize they’ve all angled themselves towards the American Flag and that they’re about to say the Pledge of Allegiance. There is no part of me that wants to join in and yet I find myself getting up, looking around to see if everyone’s got their hands over their chests. They do and so I do. Thus, with my hand pressed against my sternum, I begin reciting the words to the Pledge of Allegiance—trying my best to look sincere, but failing miserably thanks to the walrus-mouthed man next to me who insists on saying the last word of each line a half second faster than the rest of us. 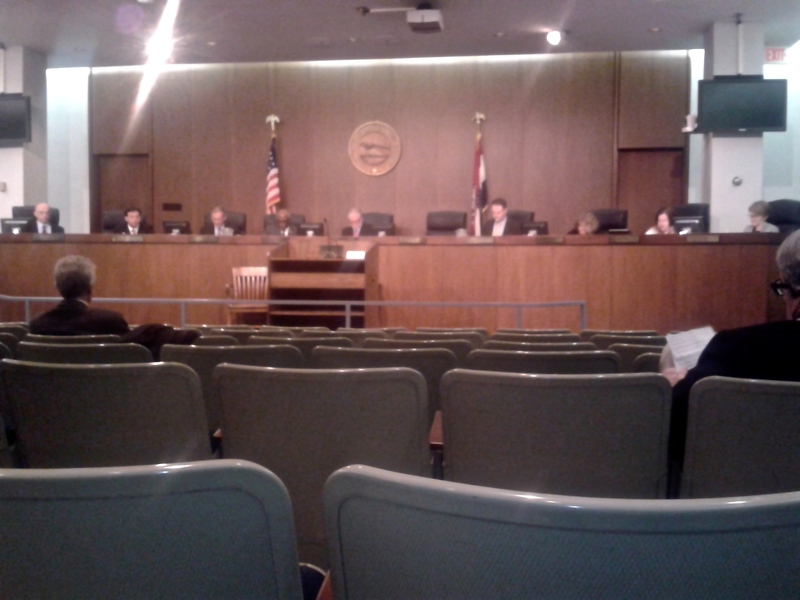 Once that’s over, everyone sits back down so that the St. Louis County Council can conduct their weekly meeting. Only a couple dozen community members, politicians and journalists bothered to show up at County Council Chambers to watch the proceedings. I only have to watch the meeting for a couple of minutes to conclude that the low turnout was justified. Most of what transpires is equal parts inscrutable and dull, with council members voting on bill introductions and amendments that were read at a pace that was impossible to follow unless you were already familiar with legislation in question. The response from the council members is complete and utter apathy. Of the 10 city council members and government officials seated on the dais in front of her, 5 are white men, 4 are white women and 1 is a black man. Watching the unconcerned faces looking down on this woman, it becomes quite clear that she is less than an afterthought to them. They may be obligated to allow her to speak her piece for 3 minutes, but they are not duty bound to pay any attention. Once they have paid lip service to the idea of community participation in government, they can go back about the business of ignoring that community when its goals don’t align with theirs. During the half hour or so during which the meeting took place, there was no mention of the impending decision by the Darren Wilson grand jury. The names of Mike Brown and Kajieme Powell were left unsaid. There was no discussion about the fact that just 24 hours earlier, the state’s governor, Jay Nixon, had declared a State of Emergency, activating National Guard troops and placing the St Louis County Police Department in charge of policing any protests in the City of Ferguson. None of the council members talked about creating partnerships with leaders in Ferguson’s faith communities or with member organizations of the Don’t Shoot Coalition, who have their fingers on the pulse of the community. It was as if, within the confines of that little meeting room, Darren Wilson and Mike Brown had never existed. But they did and they do exist. If they didn’t I wouldn’t have driven 350 miles through the night on Monday to come here and try to do what little I can to chronicle this moment in time. Regardless of what transpires after the Darren Wilson grand jury verdict is passed down, I can guarantee you that it will transformative. For good or for ill, this verdict will indicate whether we as a society have opted for racial animus or racial reconciliation. After George Zimmerman’s acquittal in the killing of Trayvon Martin we were angry, but we were also shocked. Up until then, many of us still held onto the belief that our government and our courts could still serve us. But not anymore. Today, that shock has worn off and we find ourselves left with the stark reality that in 2014 a white police officer in America can kill an unarmed black man and never even face criminal trial. The center cannot hold here in Ferguson, just as it cannot hold all across our nation. And, while I don’t know much, I know that a change is going to come and that this change won’t be coming because of the St. Louis County Council. It will come in spite of them. Gonna have to check back as events unfold — I look forward to your take on what transpires. Excellent piece, perfectly displaying the feeling of overwhelming indifference. As an outsider (thankfully living in a country more developed both politically and racially, to a great extent) I am watching this with trepidation. Knowing what I’ve discovered about the attitudes of police in the state, and knowing of the exposed suggested links between the PD and race-hate groups, I completely understand any anger I see. I don’t want to see it, but I understand it. I hope it doesn’t happen, because the media is extremely biased already and it’s going to stoke more violence and retaliation, but I almost expect to see it given the utter abuse and humiliation being delivered by the elected, and the supposed “servants of the people”. The Ferguson situation has ripped the stitches off of a not-yet-healed wound, and we’re seemingly just waiting to see if it opens again, and how much it will bleed.